Days before the International Day for Monuments and Sites (also known as World Heritage Day) and in the middle of the Roman Catholic’s observance of Holy Week, the majestic Gothic cathedral of Notre Dame, one of the most important heritage sites in the world, was engulfed by fire. The world watched in pain, worrying not only about the 856-year-old UNESCO World Heritage Site but also of all the priceless historical artifacts it beholds. The world-renowned spire, where Victor Hugo’s famous character in The Hunchback of Notre Dame was often depicted, collapsed and fell through the roof. It took the Paris fire department nearly 400 firefighters and nine gruelling hours to put out the flames and save the monument from total destruction. According to a tweet by Paris firefighters, two policemen and one fireman were “slightly wounded” in the scene. An analysis of the seen found that the fire damaged two-thirds of the cathedral’s roof. One part of that roof’s wooden framework was built in the 13th century while the other was in the 19th century. “We can consider that the main structure of Notre-Dame has been saved and preserved,” Gallet told local reporters in Paris. He added that the two main towers of the cathedral had been saved. As for the artifacts, artworks, and other relics inside it, Paris Mayor Anne Hidalgo was the first person who announced what were saved. In a tweet, Hidalgo said “the Crown of Thorns, the tunic of St. Louis, and several other major works are now in a safe place.” These artifacts were immediately brought to a room inside Paris City Hall. 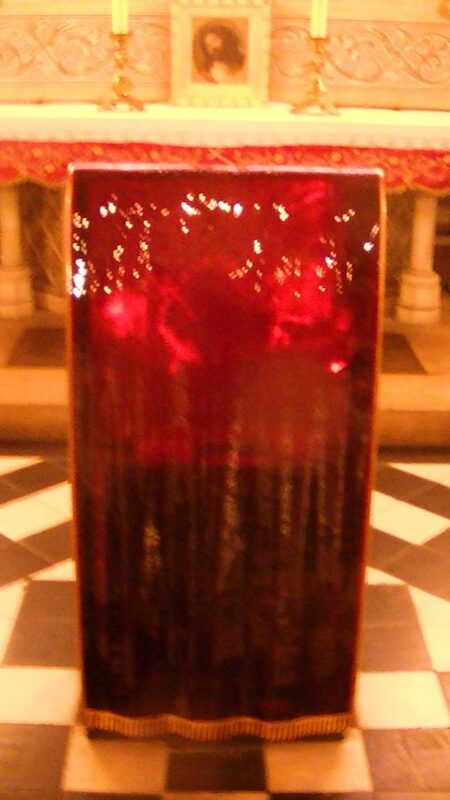 The Crown of Thorns relic is believed to be the thornless remains of the piece worn by Jesus Christ at his crucifixion. According to the Encyclopaedia Britannica, it was St. Louis, then the king of France, who brought the piece to France after it was offered to him in 1238 by Baldwin II, Latin emperor of Constantinople. St. Louis placed it at the Sainte-Chapelle but after the French Revolution, it was transferred to the Notre Dame Cathedral. Well-aware of the crown’s importance to the faithful, Jean-Marc Fournier, chaplain of the Paris Fire Brigade and was formerly a military chaplain who served in Afghanistan, ran with firefighters into the burning church to take this relic to safety. He was also able to bring the Notre Dame Blessed Sacrament, the consecrated elements honored during Holy Eucharist, outside the church. Fournier is also the same priest who dashed inside the Bataclan theater in 2015, when more than 89 people were killed in a mass shooting. The white garment worn by St. Louis when he brought the crown to Paris was also saved. In a telecast interview with CBS This Morning, Paris Deputy Mayor for Tourism and Sports Jean-Francois Martins said they “made a human chain” to get as much relics as they can. 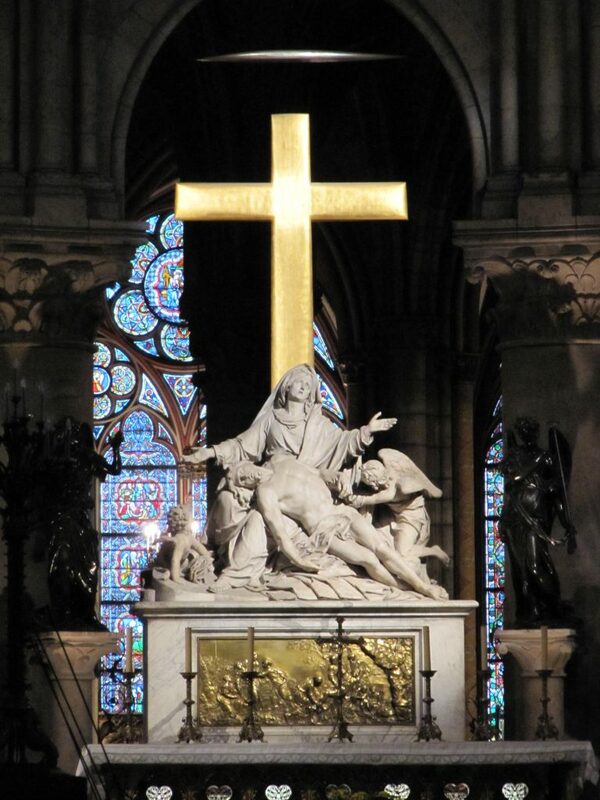 Photos inside the church that circulated after the fire showed that the cross and the white marble pietà sculpture made by Nicolas Coustou, which also survived the French Revolution, remained intact. Titled “Descent of the Cross,” the sculptures were seen still standing upright at the altar surrounded by charred debris. The other sculptures of saints and martyrs accompanying it were badly damaged but the candles behind it also survived the fire. Some parts were damaged and have melted but it can be fixed. 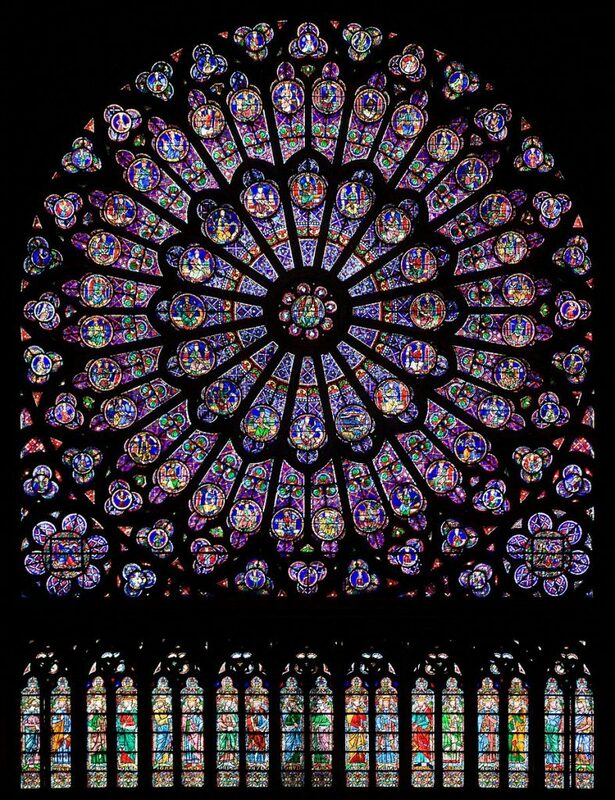 These breathtaking windows have been covering the cathedral’s three main portals since the 13th century. Each panel, shaped like a flower petal, tells a story from the Old and New Testaments. Notre Dame is also the home of hundreds of paintings. Some were even made back in the 1600’s and 1700s. These include Jean Jouevenet’s The Visitation depicting Virgin Mary’s meeting with her cousin Elizabeth, and Antoine Nicolas’ Saint Thomas Aquinas, Fountain of Wisdom. The status of all paintings is not clear yet but all recovered artworks will be transported to Louvre Museum to be treated and restored, Riester said. This five-keyboard set with almost 8,000 pipes and 109 stops is globally considered as the grandest of its kind. Its first version was built in 1403 by Friedrich Schambantz. When the cathedral was restored, two French architects built a new organ using the pipe work from the Schambantz’s version. Over the years, this organ was gradually renovated and modified by several musicians and architects but they made sure that the original pipes were preserved in it. Riester said in the press conference that the organ was saved but “seems to be quite affected” after being exposed to high heat. 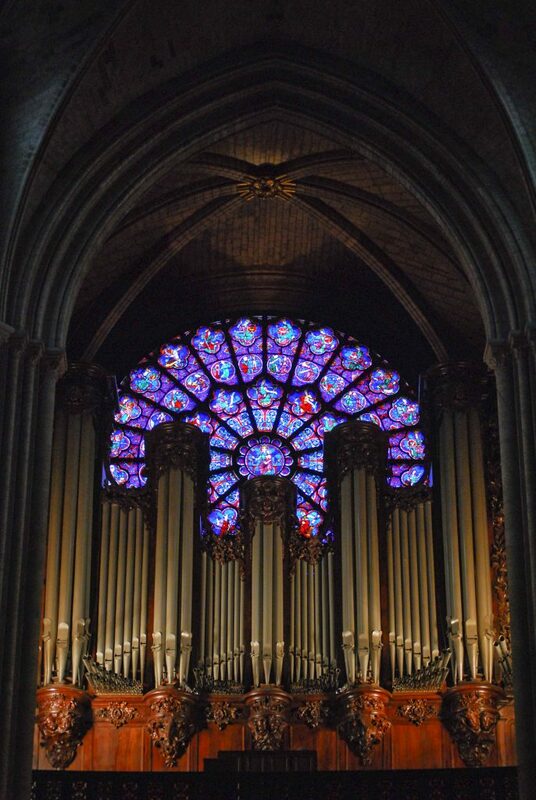 In a later interview with Associated Press, French heritage preservation official Bertrand de Feydeau said that the organ “has not burnt, but no one can tell whether it has been damaged by water.” It will be observed by experts in the following days. Ever since the fire was put out, French officials have been up in arms to save, collect, and restore all Notre Dame artifacts. However, no news about the other important Catholic relics such as the relic of St. Denis and St. Genevieve, the True Cross which is a fragment of the one where Jesus was crucified (another part of this can be seen in Monasterio de Tarlac), and the Holy Nail have emerged as of writing.